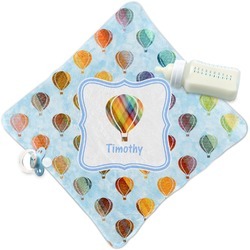 This watercolor hot air balloons design is simply adorable. The design background is the blue sky done in watercolor. 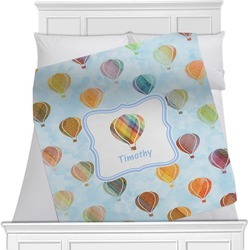 The hot air balloons are also done in watercolors; in shades of oranges, reds, greens & teals. 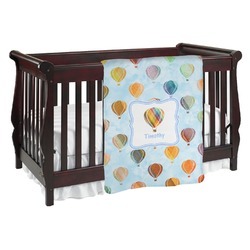 We chose to personalize it with a decorative square label and our graphics & text style. 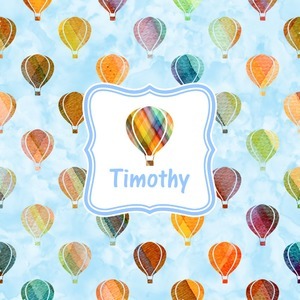 We chose to use a hot air balloon as our graphic from our transportation collecton and used a name for personalization. We chose baby blue for our color to coordinate with the sky.